I’ve been rather busy lately with work and overseeing the final stretch of home renovations. Thanks to Grace’s influence, I’ve also warmed up significantly to the idea of having a pet dog sometime after we move into our new home. 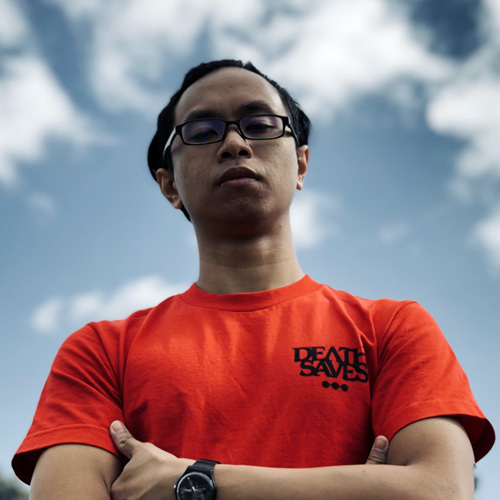 And as dog owners in Singapore would know, HDB residents are limited to specific breeds of dogs so I’ve been reading up on which ones might be more suitable to our lifestyle and personalities. Among the shortlist are the Dachshund, Pomeranian and Jack Russell terrier. I wish I could add the Pembroke Welsh Corgi to the list but sadly, it’s not HDB-approved. All of these are generally lively and playful breeds that Grace and I think we would love. We can imagine ourselves taking the dog out for walks or runs around the neighbourhood when we get home from work – it would be such a great addition to our family. That’s a future we’re looking forward to. But back in the present – more specifically last weekend – I was driving around in the latest MINI John Cooper Works, a car that in many ways is like these breeds we’ve shortlisted. 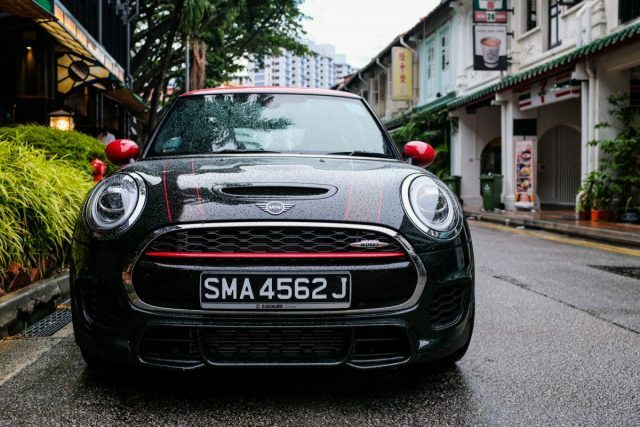 In the world of hot hatches, the 3-door MINI John Cooper Works – henceforth referred to simply as JCW – represents a passion for motor racing that began 59 years ago. In the 1964 Rallye Monte-Carlo, the Mini tuned by legendary engineer John Cooper debuted as the underdog (excuse the pun) but went on to win thrice in four years. While a lot has evolved in the automotive industry over the past decades, the principles from those early years of the partnership seem to have lived on in the latest incarnation of the JCW. A stylised Union Jack motif now adorns the passenger’s side of the instrument panel. 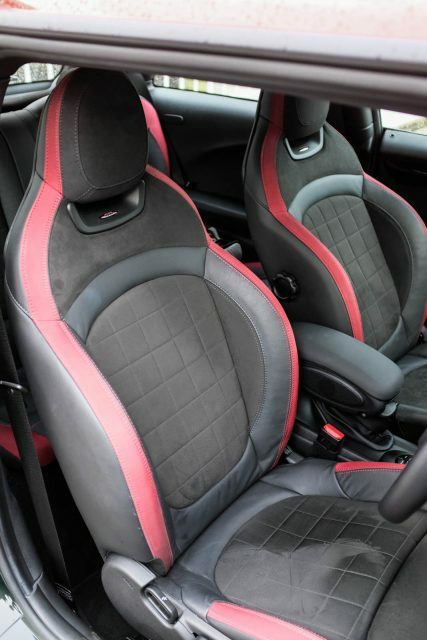 The John Cooper Works Sports Seats with Dinamica/Leather combination upholstery. If the numerous badges and sporty red stitching don’t provide enough clues, the sonorous growl after flicking the ignition switch should leave no doubt about the car’s personality. 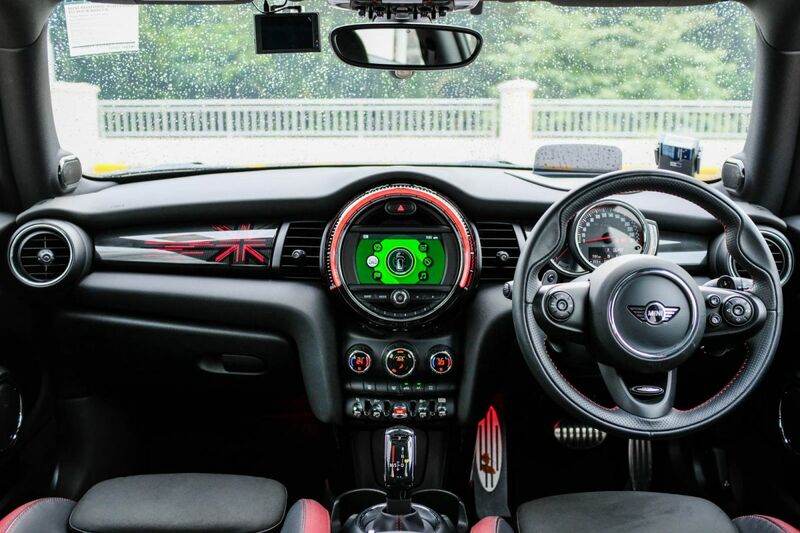 The interior is uniquely MINI with its distinctive circular displays and toggle switches. 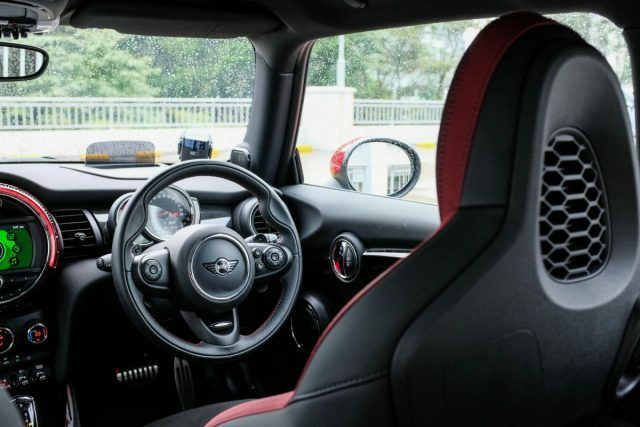 The John Cooper Works Sports Seats with Dinamica/Leather combination upholstery provide a snug fit, the side bolsters holding front occupants in place as the car tracks around bends, living up to MINI’s famous road-handling reputation. More Union Jack motifs in the tail lights. And you will have plenty of opportunities to appreciate the supportive seats, because beneath the bonnet is the familiar turbocharged 2.0-litre lump producing 231 hp and 320 Nm of torque in a very usable range of 1,450 – 4,800 rpm, mated to an 8-speed Steptronic sports transmission (not the dual clutch like in the MINI One reviewed recently, though). 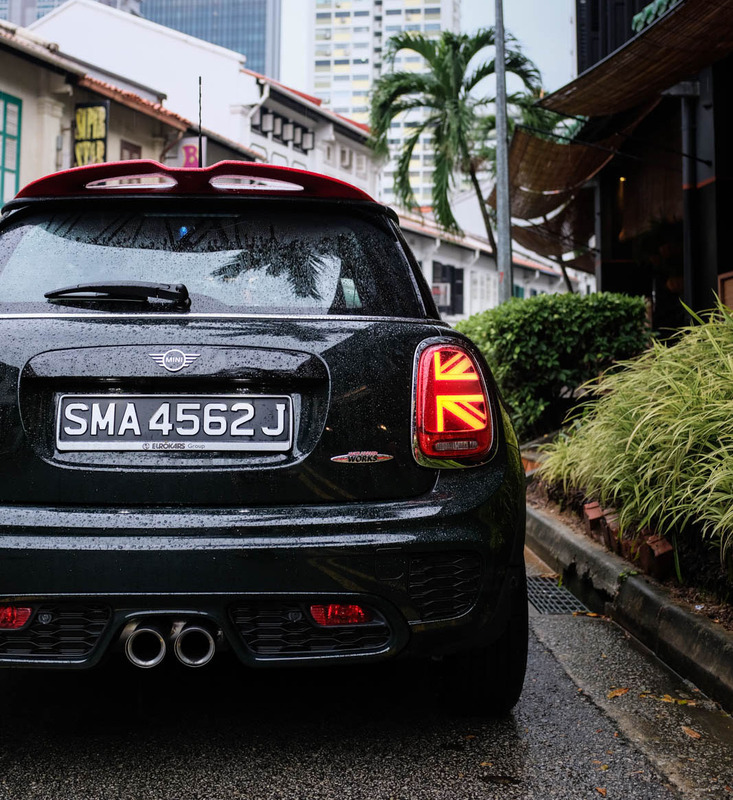 That helps the JCW complete the century sprint in 6.1 seconds – not too shabby for a car on the lower side of S$180,000 in Singapore. 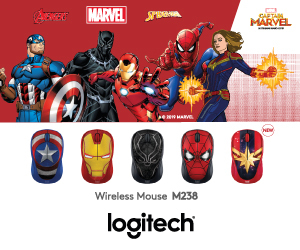 That athleticism comes with a personality, too. Drive sensibly and it’ll respond obediently with a linear power delivery similar to a naturally-aspirated car, but you can always sense it’s straining at the leash, waiting to spring forward at the first opportunity. Flex your right ankle a little more and it’s like playing fetch with a highly excited Jack Russell – with its leash wrapped around your wrist. The grip-tightening acceleration is paired with the JCW’s booming exhaust. In Sport mode, it will also tickle you with pops and crackles from its rear. It’s a good laugh but you have to be in the right mood for it. In my first few hours with the JCW, I found the driving experience a little frenetic. As I got used to its personality over the weekend, I started growing fond of its natural enthusiasm. I learnt to anticipate the JCW’s quirks. It was like building a bond with a puppy. So while I thought I might actually not fancy the JCW after my first drive in the car, I found myself taken to it the more time I spent behind the wheel. But just like any pet, the JCW isn’t perfect. The centre armrest is back to cause an annoyance as it gets pushed up every time you raise the handbrake. In my driving position, my elbows tend to bump against the armrests – the aforementioned and the one on the door – when I’m turning the wheel in either direction. It made me hesitant about going fast along winding roads in the JCW, worrying that my steering movements might be impeded. Another reviewer suggested to avoid this by holding the wheel at ten and two o’clock instead of nine and three o’clock; while that helps, should a hot hatch be ergonomically compromised? The head-up display can project your speed, revs, and the best moment to manoeuvre a gear shift. The other peculiarity is the mirror on the driver’s sun visor. 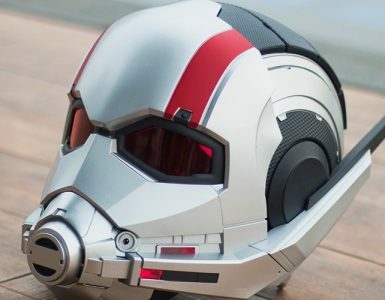 When you flip it down, you’ll realise it’s not facing where your head is but at an off-angle towards the centre of the car, so you have to strain your neck to see your own reflection. 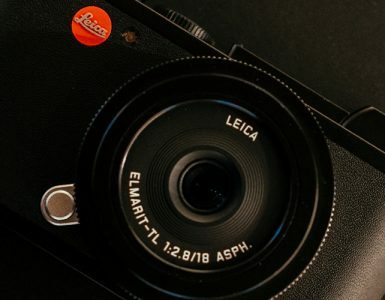 It’s like they brought someone in from Alfa’s design team for a practical joke. So the JCW has flaws, but are they significant enough to turn eager drivers away from buying one? That question can only be answered with certainty after you get into one and have a go in the car yourself. With my intention to welcome a characteristically playful canine into the family somewhere down the road, the MINI JCW’s personality is something I can certainly live with – shortcomings and all. But like a dog full of energy, it deserves to be free from urban confines every once in a while; there’s little doubt the JCW will feel very much at home on a track. 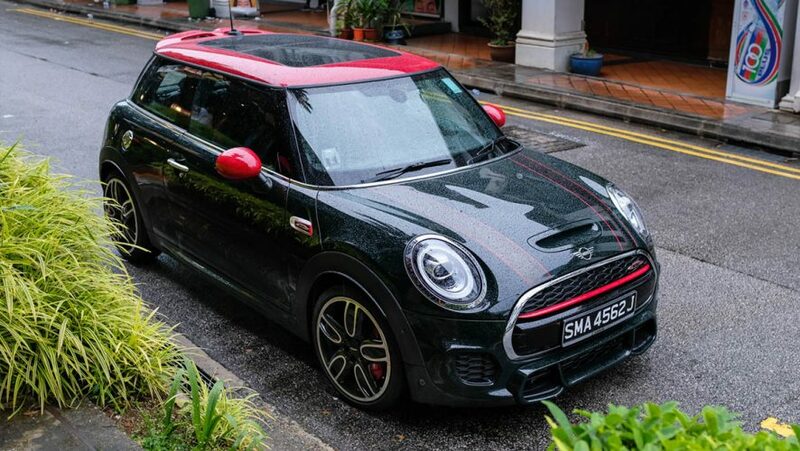 After all, that’s where it all began for MINI and John Cooper. Driving the MINI John Cooper Works is like building a bond with a puppy. It’s not perfect, but it’s a lot of fun.